Established by Creighton Muller in the year 1962, Lakewood Auto Body is a locally owned and operated car painting/truck painting and auto body repair shop. Since decades, we have been meeting the car painting needs of Suzuki owners in Spanaway, WA dedicatedly. 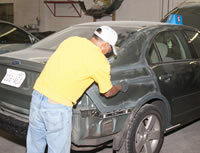 It is the basic goal of our ASE and I-Car certified mechanics to excel in all auto body paint jobs that they do. Tireless pursuit of perfection and customer service in all jobs we do has got us where we are now and so we make efforts not to abandon our roots. We give closest attention to all projects we undertake and offer exemplary quality workmanship. We put in our best to keep our company ahead of all the competition in the industry. Car owners generally get their car completely repainted for one of the two main reasons: either if the vehicle is damaged in an accident or to change an old car paint finish which is cracked, dull, and chipped. The skilled auto painters at Lakewood Auto Body can paint even over only the damaged part and then blend it with the existing surface with such expertise that you cannot make out which portion was damaged. We help maintain the original look of your Suzuki and enhance its resale value. Come to us for exceptional car painting/truck painting in Spanaway, WA. Why Lakewood Auto Body in Spanaway, WA? Lakewood Auto Bodyhas been the number one auto body repair and car painting/truck painting shop for Suzuki owners of Spanaway, WA. Providing superior guaranteed lifetime warranty at economical price makes us one of the most successful and leading car painting shop in the entire state of Washington. Looking for efficient, quick and economical auto body paint services in Spanaway, WA? Call Lakewood Auto Body today.